The Russian government is struggling to improve the image of the worker – but it’s going to be an uphill battle, and it’s going to be up to the state. Yelena Matuzova, a worker at a minerals plant in the single-industry town of Pikalyovo, has learned the hard way how to feed her family of four on 14,000 rubles (about $440) a month. She makes the best of a land plot to grow potatoes and other produce. A few years ago, she applied to the top management of Basel Cement, which runs her factory, and was lucky enough to get a two-room apartment that she has since furnished sparsely. And when things became intolerable – as they did in spring 2009, when workers did not see their salaries for months due to the crisis – Matuzova joined about 200 people in a protest, calling on then Prime Minister Vladimir Putin to sort out the wage arrears. After meeting with plant owner Oleg Deripaska, he did just that. Today, as economic turbulence brings the threat of further layoffs, Matuzova still has the same options to fall back upon – the earth with its produce and the government with its intervention. “People are talking of hard times ahead. They’re canning vegetables and mushrooms, as though they’re preparing for the worst,” Matuzova said. Two decades after the collapse of the Soviet Union, the poster children of the Communist elite – the factory workers, assemblymen, skilled electricians, plumbers and other representatives of trade labor – still face a double disadvantage. They have lost the social benefits they enjoyed during the Soviet Union that compensated for low salaries, but the market economy has failed to increase their salaries. Now, Russia’s government is once again stepping in with efforts to raise the prestige of the worker through state-backed incentives. Last month, Igor Kholmanskikh, a tank-factory worker who has been turned into a presidential envoy, offered to reintroduce the “hero of labor” award – a Soviet-era title that came not just with a good name but with a slew of social benefits. Matuzova likes the idea, precisely for the benefits. But experts say this will be an uphill battle: with salaries low, workers remain in a state of dependency, and that does not mesh well with prestige. At the heart of the conundrum are salaries; compared to Europe, they are still low across the board. According to figures from the State Statistics Service, the salary for traditional trade professions – the kind sought after in the industrial sector – averaged about 17,000 rubles a month ($530). That is below the national average of about 20,300 rubles per month ($630) as of 2010. Meanwhile, 71 percent of the jobs offered on the market fall into the trade labor category. Yet another factor is a staggering wealth gap – not just between classes, but between labor professions. According to statistics from the Independent Institute for Social Policy, only 33 percent of Russians met the 20,300-ruble average ($630), while the rest of the population earned far less. This disparity is explained by the fact that Russia’s top salaries are as much as 25 times the size of the smallest salaries. This is a familiar problem for Matuzova, who works at a plant where salaries average over 25,000 rubles ($780). 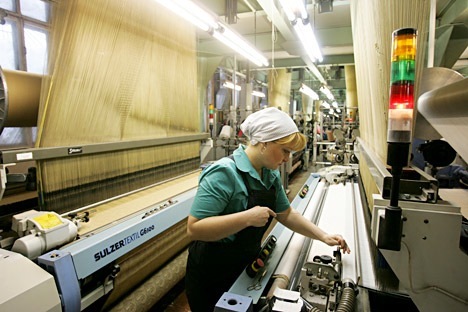 According to the 2010 figures from the State Statistics Service, workers employed in the textile sector made as little as 10,074 rubles a month ($315), while those in the energy production sector could expect up to 50,000 rubles a month ($1,500). Bizyukov believes incentives for workers are crucial. However, unless salaries can be raised, re-introducing a Soviet-era award in market conditions will not work. One reason is that businesses – whether foreign or domestic – can still get away with paying their employees far smaller salaries than they would in other BRIC countries. “I’ve spoken to workers at the Ford Motors plant in Vsevolozhsk: they make an average of about 30,000 rubles a month ($940), but their colleagues in Brazil still make twice as much,” Bizyukov said. Shershukov acknowledges that, given Russia’s particular features, the government is forced to play a stronger role in protecting workers than it would in Europe. He cited France as an example: Despite violent protests, its parliament went ahead with a widely unpopular reform to raise the pension age. Russia’s unions, he said, have so far successfully lobbied the government to stave off raising the pension age. That may mean a more robust role in supporting workers than offering a labor award. Though, for many like Matuzova, it may also mean continued reliance on the state.